Lots of things are happening on site today. Barry is using a power planer to remove excess wood from all sorts of places on the boat while Ian is drilling more holes in the wheel retaining straps .Adrian is removing sections of scaffolding along the wharf wall which is no longer needed and Carol is acting as Official Camera Man. 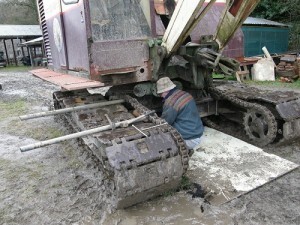 Trevor in the meantime is wallowing in the mud beneath the RB22. He is modifying the pair of sacrificial blocks of wood which have been fixed onto the crane’s sub frame. The previous attempt to use sacrificial blocks was quite successful although the bolts use to retain them were fouling the chains. 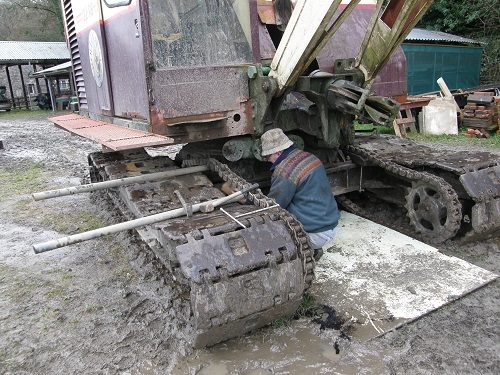 For all concerned working conditions are very difficult because of the wet and mud but Trevor deserves a medal for persevering and successfully achieving his goal in such awkward and trying circumstances.